Tomorrow, Author, ERIC MAISEL will be visiting my blog as the last day of the Ten Zen Seconds World Blog Tour. If you have been keeping up with the tour, then you have read some interesting ways to use Eric's technique of mixing mindfulness with a simple breathing technique. Ten Zen Seconds introduces a new, powerful approach to mindfulness. It is a book, a practice, and an invitation to live a more centered, grounded, and meaningful life. Marrying Eastern and Western techniques, it builds on the simple idea that deep breathing coupled with right thinking is the perfect tool for growth, healing, and transformation. The first in a series of books exploring this next step in the practice of mindfulness, Ten Zen Seconds offers you the tools to make changes, solve problems, and simply feel better. Dr. Eric Maisel is the author of more than thirty books. He holds Bachelor’s degrees in Philosophy and Psychology, Master's degrees in Creative Writing and Counseling, and a Doctorate in Counseling Psychology. He is a California licensed marriage and family therapist, a creativity coach and trainer of creativity coaches, a columnist for Art Calendar Magazine, provides regular segments for Art of the Song Creativity Radio, and teaches Ten Zen Second techniques through lectures, workshops, and teleseminars. He lives in San Francisco. Today we will focus on what Ten Zen Seconds is about and what the phrases are. AM: What is Ten Zen Seconds all about? AM: Where did this idea come from? AM: What sort of hunt did you go on? AM: Which phrases did you settle on? Tomorrow I will repeat the incantations and ask Dr. Maisel how artists can use them in managing their high energy creative lives. Upcoming at Transformer July 11 - August 5, 2007 The Exercises for Emerging Artists - E4: New Media Now in its fourth year, The Exercises for Emerging Artists is a unique, peer critique and mentorship program Transformer created to encourage and support DC area artists in the development and presentation of a new work, or new body of work. Designed for artists beyond the art school experience, but still emerging within their careers and seeking feedback by peer artists and mentors, The Exercises provides a vital opportunity to assist artists in furthering their creative practice and building networks of support. Recent Exercises graduates include Lisa Marie Thalhammer, who will be exhibiting a new series of work at G Fine Art this Saturday, June 2, 2007. Designed as a series of focused 'salon style' discussion sessions spanning several months, during the course of The Exercises participating artists work with Transformer's Advisory Council, curatorial staff, invited guest curators, more established artists, and other arts professionals to gain insightful feedback on the artistic process, culminating in an exhibition of experimental new work. Mentors have included Andrea Pollan, Curator's Office; Annie Gawlak, G Fine Art; Leigh Conner, Conner Contemporary Art; Paul Roth, Corocoran Gallery of Art; Steven Bradley, University of Maryland, Baltimore Campus; Don Russell, Provisions Library; and Alberto Gaitan, artist, among others. The current installment of The Exercises, tentatively titled E4: New Media, involves four dynamic artists working with video, sound and other media. Rebecca Adams, Carolina Mayorga, Rob Parrish, and Fereshteh Toosi will each take over the Transformer project space for unique, one-week long, individual project presentations. E4 is being facilitated by guest curator Niels Van Tomme, an independent curator, art critic, co-director of ICP/A (International Curators Program Antwerp) and the curator of Multimediale - a four-day multimedia arts festival in Washington, DC, April 2007. Please visit Transformer's website http://www.transformergallery.org for updates on E4: New Media as it continues to develop, and to take a look at other artists who have participated in this important program. Founded in summer 2002, Transformer is a Washington, D.C. based 501(c) 3 non-profit, artist-centered, visual arts organization that connects and promotes emerging artists locally, nationally and internationally. Partnering with artists, curators, art spaces and other cultural entities, Transformer serves as a catalyst and advocate for emergent expression in the visual arts. Exhibitions hours are Wednesday -Saturday, 1-7pm and by appointment. Transformer is supported by The Andy Warhol Foundation for the Visual Arts, The DC Commission on the Arts and Humanities/NEA, the Morris Gwendolyn Cafritz Foundation, The Eugene and Agnes E. Meyer Foundation, and The Visionary Friends of Transformer. Perhaps he was just being polite to Nationals fans, but D.C. Sports and Entertainment Commission CEO Allen Lew says he will go to bat for "some sort of Washington Baseball Hall of Fame in the Stadium." This was reported Thursday, March 29, 2007 on "Nats320 -- A Washington Nats Blog." On Sunday, 3DG will unveil its latest project - Washington, DC's first boutique residential condominium that will be LEED-Certified. At the tipping point in "green" awareness, this project represents how sustainable design and construction practices are being used in today's market. 3DG, a company born and raised in the rapidly transforming Columbia Heights neighborhood, has taken a typical Washington, DC Wardman row home and retrofitted it with the latest environmentally sustainable technology and construction methods. This project marks what many hope to be a shift to a "triple bottom line" approach to development as it is socially, environmentally and economically favorable. The open house will provide visitors with an in-depth and interactive learning experience about the "green" features that will make this a LEED-Certified building. In addition, they will see "green" living from a more holistic approach as they are invited to tour a model unit outfitted completely with sustainable furniture and complimented with environmentally friendly household products and foods. For directions, please click here . If you have any questions, please feel free to contact us at (202) 298-6636. We hope to see you there! 3DG is proud to introduce its most environmentally advanced project ever, located at 1362 Otis Place, in the rapidly developing Northwest Washington neighborhood of Columbia Heights. The project represents a breakthrough in the DC condominium market, as the first small-scale, LEED-Certified spec development in the Washington area. And it represents a breakthrough for 3DG, as the first project the DC-based architecture, development and construction firm has taken from start to finish with the specific goal of LEED Certification. To celebrate the accomplishment and spread the word, 3DG will host a Green Building Open House on Sunday, June 3rd, 2007, from 1-5 PM, in partnership with Crate and Barrel, whose first Green line of home furnishings is being introduced nationwide this Spring. Refreshments will be served, including organic foods, wine, beer and soft drinks. 3DG experts will share information about the environmentally friendly methods and technologies employed in the building, and product literature and samples will be available. Interested parties can obtain sales information and discuss financing options for the condominium units, which are offered for sale through Tutt, Taylor & Rankin Sotheby's International Realty. 3DG delivers world-class architectural design, project administration, construction and real estate services to the Washington DC-area residential and commercial real estate markets, as well as a limited number of high-end single-family and multi-unit dwellings designed and developed in-house. Employing a highly qualified team of award winning architects, LEED-accredited professionals, interior designers, construction management professionals, licensed real estate agents, and financial analysts, 3DG is able to provide a unique, holistic approach to development, project management, and property buying, leasing and selling. For further information regarding any of 3DG's design, construction and development projects, please visit 3dgllc.com or contact us at info@3dgllc.com or 202.291.3282. Saturday June 2, 11-8 PM Participating in summer openings, we will be open this Saturday until 8:00 PM. June 3, from 1-2:30 pm. Opening Reception/Walking tour. On Friday, June 8 from 7-9 pm, there will be a free reception for all the artists in the three June Exhibitions. Steel can be flexible or rigid; a massive volume or a thin line; a surface to etch or reflect. It is an enormously variable material and the artists here have welded, cut, polished, and painted their works-taking advantage of the multiple facets of this difficult medium. From Carmen Barros Howell's lovely, rusted figures to Chris Bathgate's polished brass and steel machine-like structures, the artists use both surface and mass to create fascinating imagery. Chris Bathgate's works are built steel pieces that have the look of machine made pieces but the presence of an artist's mind at work. He uses mathematical techniques to achieve the high degree of precision that is required to create these fascinating fabrications. Pete Campbell, a painting graduate of Maryland Institute of Contemporary Art, welds dynamic abstract works that have a painter's touch. John D. Ferguson, creates painted welded steel curvilinear forms. His work is in the collection of the Hirshhorn Museum and Sculpture Garden and he has had numerous commissions and exhibitions including a solo exhibition at the Phillips Collection in Washington, DC. Carmen Barros Howell, a Chilean born artist, has shown her work worldwide. Her sculptures of welded metal often take the figure or face as their starting point. In her use of the negative space, her creations gain both presence and personality. David Hubbard constructs his "Monuments" series in steel and stainless steel, often combining a rust coated surface with a polished brush steel surface, thereby adding both color and texture to his works. A graduate of the University of Maryland, Hubbard has had numerous exhibitions and commissions. His work is in many collections, both public and private. Minna Newman Nathanson works with the reflective qualities of metal and uses these to counter viewer's expectations and perceptions of the materials. She uses folds and the edge to create tensions of scale and position. An educator and curator, Ms. Nathanson has been involved in many Washington arts organizations as both a board member and exhibiting artist. For more information please call (301) 953-1993 or (410) 792-0664 or TTY (301) 490-2329. Gallery Hours:10 A.M. - 5 P.M. seven days per week. "Nationals’ stadium art project at a standstill." Author, ERIC MAISEL will be visiting interesting bloggers this week to speak about his breathing and mindfulness techniques in his new book, Ten Zen Seconds. Eric will visit me on the last stop of the tour on Friday, June 1 and will answer a few questions about making meaning and making a living. I hope you'll join us this Friday. Here's the week's line up. Enjoy! Donna Druchunas is a freelance technical writer and editor and a knitwear designer. When she's not working, she reviews books about science, religion, and skepticism and mouths off on the Skepchick blog where she is part of a team of thinking women who reject superstition and pseudo-science and prefer to use reason and evidence to understand the world. Donna and Eric will be chatting about mindfulness for the skeptic: how creativity and mindfulness can be nurtured without appealing to a higher power or a mystical muse. A small-town girl from Oregon, Maya loves exploring different cultures. She lives in Buenos Aires, Argentina with her husband and three of her four daughters. She chats about mindfulness on her blog at www.MassageYourMind.wordpress.com and plays with all things passionate at www.SexySpanishClub.blogspot.com. Maya and Eric will focus on mindfulness and FUN--using the Ten Zen Seconds method to pop into ?mindfulness mode? and connect to our sense of wonder. Alyson B. Stanfield is an art-marketing consultant who writes on the business of art for her Art Biz Blog, http://www.artbizblog.com. It is intimately connected with the weekly Art Marketing Action newsletter, available at http://www.artbizcoach.com. Postings range from pricing and promoting your art to working with galleries and cultivating collectors. Alyson and Eric will focus on mindfulness techniques for visual artists in the studio and in the art office. Isabella Mori is a psychotherapist and writer. Her blog "change therapy" deals with the wide range of experience of our inner lives, from the joyous " 9 ways to feed the spirit to the academic 10 paradoxes of creative people , from the hopeful recovering anorexia to the amusing Inspired by Dr. Suess. Special interests on the blog are spirituality, the arts, peace, gender issues, as well as body image and eating disorders. Isabella hosts the monthly Carnival of Eating Disorders, a readers' digest of blog posts on topics related to eating disorders. One of the wonderful attributes of being an artist is that we are interested in so many things. This is much of what fuels our creativity. However, sometimes, these often very widely diverging interests become overwhelming and it feels like we're drowning in ideas. Isabella and I will chat about applying Ten Zen Second techniques to this important issue. Anne Marchand is a full-time artist who creates colorful, energetic abstract paintings with poetic connections to life. Anne's cityscape, public art murals adorn playground walls in Washington, DC. Her blog, PainterlyVisions, showcases talented artists in the Washington, DC metropolitan area. Anne comments on life in the arts from her studio in Washington, DC. Her blog is a resource of exhibition opportunities, art reviews, and marketing resources. Anne and Eric will chat about applying Ten Zen Second techniques to help visual artists focus on the daily creation of artwork. 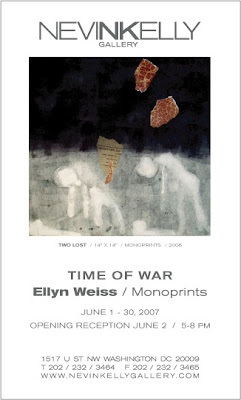 by Ellen Weiss Noted local printmaker and painter, Ellyn Weiss, will unveil a series of prints called "Time of War" at the Nevin Kelly Gallery, 1517 U Street, NW, in Washington, DC. The show will run from June 1 through June 30. "Time of War" is a series of 14" x 14" monoprints made last summer at the Fine Arts Work Center in Provincetown, Massachusetts on a press that was once used by Robert Motherwell. The artist describes them as"meditations on the pain of war, as simple and universal as I can make them - my effort to convey feeling directly with a minimum of complexity." A frequent exhibitor in the Washington area (with a solo exhibition of paintings currently on display at the Touchstone Gallery), Weiss spends her summers printmaking on Cape Cod. 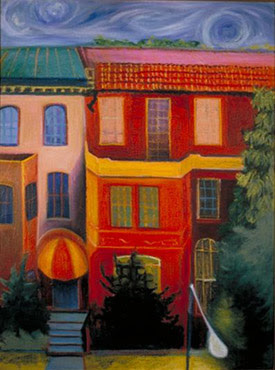 During the rest of the year, Weiss lives in Bethesda and paints in her studio in Washington, DC. As is typical of her print work, the pieces in the Time of War series are marked by dramatic imagery and a mixture of bold colors and stark black and white. Putting aside one's views on the justness of war, these works are sharp reminders that war is a hellish experience for those who are caught in the middle of it. All artists living or working in Virginia, Washington, D.C., Maryland, West Virginia, Delaware, and Pennsylvania are invited to submit slides. Artworks in all media will be considered. Ten to fifteen artists will be selected for Solo Exhibitions to take place in 2008 in one of AAC's seven galleries which contain approximately 525 combined running feet of hanging wall space, including two Experimental Galleries designed to accommodate installation, technological and other works requiring a complete environment. The grounds surrounding the building can accommodate outdoor sculpture. José Ruiz, Descendents of Ascension, a multi-dimensional, mixed-media installation. Jose continues to be guided in his interest in maintaining a visual conversation with the social issues that he describes as “out of his control.” Each investigation, materialized through a wide variety of mediums and formal processes, inherently resurfaces his ongoing focus on identity, visibility, authorship, and labor. The title, Descendents of Ascension, is an allusion to the American Dream: those who make up the US are the product of those who immigrated in hopes for a better future, and the spiritual meaning as it refers to the Mayan, Aztec, and Incan cultures, that many of the new Latino immigrants are descendants of. Many of the objects carry this double meaning, described often with a consistent transformation theme. Among the many works in the show are a sci-fi video piece, depicting immigrants charging across the border, photos of the artist himself awaiting work with day laborers, and a series of A-frame ladders made out of drywall that reference the residue of labor as metaphorical symbols of ascent and descent in social class, society and spirituality. Also included is a series of emblems, the official Descendents of Ascension flag to represent this specific territory in the public realm and in the gallery and hanging above the installation, decals of a patriotic airbrushed eagle in a “preying” position, partially painted over, resulting in a set of wings ascending rather then descending. Jose Ruiz is a curator at the Bronx River Art Center in the Bronx, NY. He is the Artist-in-Residence, for the workspace program at the Jamaica Center for Arts and Learning, Queens, NY and he will be included in the upcoming show, The (S) Files: El Museo del Barrio’s Bienal, El Museo del Barrio, New York, NY. Curator: Elvis Fuentes, July 2007 – January 2008. Vesna Pavlovic, Display, Desire, a photographic installation. In this work Pavlovic explores performance, desire, projection and participation. Using display houses as a subject, she presents her exploration of images of display and the display of images. Pavlovic projects black and white slides of these staged homes, through pieces of colored plexi-glass, distorting the images and creating a space for the viewer to experience. She uses the image, its surface and physical properties to create a heightened atmosphere for participation and time to become integral in observing the transformation and destabilization of the image. Pavlovic began her studies in documentary photography and cinematography at The Faculty of Dramatic Arts in Belgrade. She has shown in Serbia and in the US. She recently graduated from the MFA program at the Columbia University and has published several books, the most recent Office Taste co-authored with Casey Smith in 2005 and The Book Project in 2004. Lisa Marie Thalhammer, Welcome to Lizard County, a series of drawings. In this new series of work, Thalhammer investigates the underbelly of America’s Highways. Inspired by her experiences in the family’s truck stop, she draws the semi-trucks that brave vast expanses of highways connecting goods and consumers. Alone and lonely, full of desire and intent, this macho trucker world both idealizes women and supports abuse of them. Lot Lizards, a trucker term the title is based on, are prostitutes, who wait in truck stop parking lots. Thalhammer collages images of women from men’s interest magazines as hood ornaments onto the drawings, examining the way feminine beauty is both reverenced and objectified. Appropriated gospel illuminations adorn the drawings, referencing the Bible belt, where the family truck stop was located. Thalhammer was the recipient of the Young Artist Program Grant Award from the DC Commission of the Arts and Humanities in 2007, and in 2006 the Small Project Programs Grant Award from the DC Commission of the Arts and humanities. She lives and works in Washington DC, and participated in the Exercises for Emerging Artists, which culminated in the show E:3 Painters at Transformer Gallery. Adamson Gallery is pleased to present Pulp Fiction, a multimedia group exhibition of works from R. Crumb, Marcel Dzama, Hope Gangloff, Renee Stout and Kiki Smith. Running the gamut from sculpture to printmaking to pen and ink drawings, all of the works in this exhibition explore the properties of the narrative. Taking its name from one of the most popular and accessible forms of narrative, Pulp Fiction presents works that use images to tell stories. The pieces in the exhibition illustrate different narrative strategies. Brooklyn artist Hope Gangloff works from snapshots of her friends, producing lovely pen and ink renderings colored red, black, and white. Gangloff's images depict drinking, socializing: her friends play poker, go to gallery openings, fall asleep in cabs. The images, because they are taken from photographs, bear the trace of the real events from which they originate. Washington-based Renee Stout's silkscreen triptych Fatima and Black Nine uses a collage of painted "primary sources" to tell the story of the romance between a psychic and a poet: partial portraits, (a face, a hand holding a card, a woman's legs), a diary entry, scraps of poetry, a dim photograph. The information omitted is as compelling as the information given: like Stout's observant diarist, the viewer is left to piece together the account. Marcel Dzama's The Cabin of Count Dracula consists twenty hand-drawn lithographs housed in a small wooden cabin lined with beaver fur. The fanciful drawings of vampires, cowboys, children, and monsters are accompanied by a record soundtrack by Albatross Note. Like Stout, Dzama's narrative is a bricolage of parts, drawing the viewer into the history. The exhibition is rounded out by pieces from Kiki Smith and R. Crumb, who reference the narrative forms of film and the comic. In this way, "Pulp Fiction" is an exhibition full of stories and of the different ways that they are presented. For more information, please contact Laurie Adamson or Erin Boland at (202) 232-0707. Gallery plan b, in cooperation with River Gallery (Rangoon, Burma), is very pleased to present a rare exhibition of paintings from Myanmar’s leading contemporary artists including Nann Nann, Khin Zaw Latt, Maung Aw, Soe Soe, and Than Kyaw Htay. This group of artists is brought to the United States by Gill Pattison, a New Zealander, who has been a resident in Myanmar for the past five years. Ms. Pattison became involved with the contemporary art scene in the region when she sponsored and organized (in conjunction with the Myanmar Times) a national competition for Myanmar artists in 2004. The competition identified many of the best Myanmar artists––both established and emerging––several of which will be part of this exhibition at plan b. Her aim in promoting these artists was to bring their art to a wider audience...not only the tourists who visited Myanmar but also to an international audience. To this end, plan b is one of several galleries she has selected in organizing exhibitions and shows abroad. Previous exhibits were held on the west coast in San Francisco and Palm Springs and here on the east coast in Princeton, New Jersey, where Gill led a seminar on the importance of this art to the world. The West knows little about this beautiful but troubled country of 55 million people, nestled between China and India, governed by a reclusive military dictatorship that has held power for over forty years. Myanmar’s art has a surprisingly modern feel. The creative tension evident in many of the best works results from the artist’s struggle to find the means of portraying their rich culture in new and different ways. The exhibition focuses on subjects taken from Myanmar’s rich cultural and religious heritage and the country’s largely unspoiled physical beauty. Icons and symbols of Buddhism, seen everywhere in Burma, predominate in this show. By necessity, most Myanmar artists remain cautious in their choice of subject, generally avoiding themes that might be construed as overtly political or critical of the regime. But these restrictions have a surprising up-side: in focusing on what they see around them, the art has a purity and spirituality that is often absent in the art of emerging nations, where the portrayal of conflict is often to the fore. While this current generation of artists chooses their subject matter carefully, they are paving the way for those to follow, who will face fewer restrictions. And perhaps, for us the audience, there is a silver lining in the self-censorship of the Burmese artists...their focus on the beauty of their traditions and on the scenes and motifs from a unique culture that is fast disappearing in other parts of Asia, by creating distinctive works of art which convey the essence of their deeply felt cultural and spiritual heritage. Please join Nevin Kelly and staff Thursday, May 24, 6-9pm for the opening of ColorTransparencies, a solo exhibition of work by Joan Belmar. Show runs May 23 - June 17, 2007. Opening Reception Thursday, May 24 from 6 - 9 pm. The Art I Public Paces Program of New Mexico Arts and the Palace of the Governors – New Mexico History Museum seek to commission artwork fro the New Mexico History Museum currently under construction on the north side of the historic Palace of the Governors in Santa Fe. The committee seeks a timeless, highly visual original artwork that will enhance the visitor’s experience to the museum while addressing the unique connection that exists between the people and place in New Mexico. The selected artist may use any or all of the available space to illustrate this theme. Available space includes, but is not limited to, the exterior wall and landscaped area near an entrance, the floor in the crossroads gallery, main stairwell walls, and atrium walls as well as a roof top terrace. There is the option of suspended works in some of these locations. The museum also has river cobbles (rocks) used for the foundation from the 18th century available for artists who wish to incorporate them into their work. Media must be durable, low maintenance, permanent, safe for both children and adults and be ADA compliant. Additionally, the selected artwork may require certification by a licensed structural engineer and a review by a professional fine art conservator at the selected artist’s expense. Up to five finalists will be selected. This project is open to all artists who are residents of the United States. Artists must receive a prospectus to apply. The prospectus can be downloaded from the web site at www.nmarts.org or contact AIPP staff at New Mexico Arts, telephone 505/827-6490, 800/879-4278 (instate), or emailaipp@state.nm.us. I love Mid City Artists! Hmmmm...seems Mid City Artists have a fan over at The Squeaky Buddha Sessions. The third installment of WPA\C's incognito fundraiser show: 10 artist curators each create a 24 " x 24" piece and select 9 more artists to do the same. The resulting 100 artworks are then hung with no artist identification, and all sold for the same price. Only after a piece is purchased is the name of the artist revealed. Sorry, no works will be sold at the preview. Lauren Bender, Edward Fendley, Felipe Goncalves, Seth Goodman, Dale Ihnken, Ryan Jedlicka, Nicola Knight, D'Metrius Rice, Lu Zhang. Thursday, May 31, 2007 at 6:30 p.m.
After the event, visit the IDB Cultural Center Art Gallery exhibition: Young Costa Rican Artists: Nine Proposals. Dr. Kwame Dixon will examine the literary discourse of Afro-Costa Rican writers with particular emphasis on the works of Eulalia Bernard, Shirley Campbell, and Delia McDonald. Afro-Hispanic writers, except for Nicolas Guillén, Nancy Morejón (Cuban) and possibly Manuel Zapata Olivella (Colombian), are for the most part socially excluded by the traditional Latin American literary canon because their writing is considered too specific in its themes on the black experience. It is argued that the writings of Afro-Hispanic writers are socially cleansed from the larger literary canon of Caribbean and Latin American literature. This discussion aims to show how Afro-Costa Rican women, through use of identity and gendered discourses, situate Afro-Hispanic writing within the larger frame of Latin American and Caribbean literature. This lecture is being presented in anticipation of National Caribbean American Heritage Month in June. Dr. Dixon lives and works at the Syracuse University Center in Madrid, Spain, and is currently Visiting Professor of African American Studies at Syracuse University where he teaches courses focused on Race, Democracy and Human Rights in Afro-Latin America. He earned his Ph.D. in 1997 from Clark Atlanta University and his primary research is focused on understanding how race, racial discrimination and gender intersect to create particular forms of discrimination and marginalization that lead to human rights violations. Dr. Dixon is a Fulbright scholar and has conducted extensive field research on Afro-American communities in Ecuador, Colombia, Brazil, Cuba, and Nicaragua. In 1999 and 2000 Dr. Dixon served as a consultant to Amnesty International for the United Nations World Conference. Alyson Stanfield has written an interesting article on personal power and taking 100% responsibility for our actions. She features an image of my art work with this month's power article. Here's the article with one of my cityscape series paintings, "Citylife." You can see the main article Here. Last week, I posted the five principles for no-excuses art marketing, which are woven throughout the book I’m working on. I don’t know what took me so long to come up with these because I’ve been rattling them off at each and every workshop I give. They are also prominent in my coaching and classes. There are very few times in anyone’s career when they feel like they have all the power. For an artist, the power appears to be in the hands of galleries, curators, granting agencies, collectors . . . anyone but you! It’s easy for this to overwhelm you. It’s easy to allow it to plunge you into victim mode--particularly when you’re hanging out with a cadre of other artists who have chosen complaining over taking action. But all of these people have only as much power over you as you give them. When you agree to stop playing the victim and accept 100% responsibility, you’ve taken the leap to being a more professional artist. You will ultimately be a more fulfilled and productive human being. What are the other four principles guiding no-excuses art marketing? KNOW THIS----------~> People will take as much of your power as you allow them to. THINK ABOUT THIS---~> What have you lost control over? DO THIS------------~> Assume control. Make a list of the things in your art career that aren’t going as well as you would like. Where did they go wrong? What can you do to ensure that won’t happen again? To whom have you given too much power? What can you do to change that or to ensure it will be different with a new relationship? Jackson Martin uses steel, glass, and burlap to represent the human propensity toward order and control and its relationship between the natural and the cultural. He alternately uses ephemeral materials, such as trees, soil, water and light that represent uncertainty and the unpredictablity of the world around him. His enclosures, acting as cultural elements attempt to hold and embrace the natural, while still being of industry. It the antithesis of good and evil, the uneasy if not forced alliance of man/man made vs natural, and of nature. Michael Sandstrom alternately, explores how camouflaged political controls filter our understanding of history and relinquish our ability to accurately observe and respond to current socio-political events. Fundamental to his formal concerns is his use of petroleum-based plastics and resins. Thought, the true currency of our time, access to petroleum is one of the most decisive factors in determining the wealth and power of a nation. The lustrous surface of resin appeals to our penchant for "beauty" seducing the viewer to draw near. It acts as a barrier, restricting the viewer's access to embedded objects. Resin, becomes a metaphor for government, protecting the viewer from the "harmful truths" beneath the surface. Both Jackson Martin and Michael Sandstrom are recent graduates of MICA and both live in Baltimore, MD. Michael Sandstrom, recently won a Fulbright Scholarship to Berlin. The DC Commission on the Arts and Humanities, in collaboration with the Washington Nationals, the DC Sports and Entertainment Commission, and Hellmuth Obata and Kassabaum, P.C., seeks an artist or artist team to design and create a suspended public art installation along the main concourse of the new Washington Nationals baseball stadium. The goal of this public art project is to provide an exciting arts enhancement to the interior of the ballpark while celebrating the spirit of our national pastime. The work will be visible along the main concourse, across the field from Baseball Plaza, and from street level on the south side of the ballpark. The total budget for the project is $200,000. For more information, email Emily Blumenfeld and Meridith McKinley or call (314) 664-5902. Drawing form a broad array of influences spanning from Hieronymus Bosch to Arshile Gorky, Walter Kravitz creates large-scale drawings and paintings based on landscape and figurative images in various states of both abundance and decay. With a surrealist's openness to spontaneity and intuitive understanding of the subconscious, Kravitz builds these works using exquisitely expressive line work and a restrained and judicious use of color. The viewer is drawn into a works that is fascinating and compelling yet strange and disorienting as well. Working with a palette of more that 1,000 tones originating from close-up photographs of skin, Solomon T. Wondimu creates mural-sized digital images and paintings that explore the conflicts and assumptions that exist between the eye and the mind around the concept of skin color. McLean Central Park Rain or Shine! A one-day juried fine art and craft show and sale featuring the work of 40 local and regional visual artists. Live entertainment will be provided by performing arts groups and a children’s art tent will offer activities throughout the day. McLean Central Park is located in McLean, Virginia, a suburb located approximately 10 miles from Washington, DC. McLean Central Park is located on the corner of Dolley Madison Blvd. and Old Dominion Drive. In the event of inclement weather, MPA artfest will be held inside the McLean Community Center, which is adjacent to McLean Central Park. $150 participation fee, if accepted. 100% of sales to be retained by artist. Each artist will be provided with a 10’ x 10’ tent. MPA artMoney will be distributed to corporate and individual sponsors to be spent the day of the event. MPA will reimburse the artist for the MPA artMoney spent. MPA artMoney can only be used for the purchase of art. MPA is a non-profit visual arts center founded in 1962. The mission of McLean Project for the Arts is to exhibit the work of emerging and established artists from the mid-Atlantic region; to promote public awareness and understanding of the concepts of contemporary art; and to offer instruction and education in the visual arts. In addition to its program of high quality, professionally-curated art exhibitions, MPA presents special traveling exhibitions from the Virginia Museum of Fine Arts. MPA artfest is co-sponsored by the McLean Community Center, Fairfax County Park Authority, and Dranesville Supervisor Joan DuBois’ office, along with corporate and private individuals, and supported by the McLean Chamber of Commerce, Friends of McLean Central Park, and the Arts Council of Fairfax County. MPA artfest is co-sponsored by the McLean Community Center, Fairfax County Park Authority, and Dranesville Supervisor Joan DuBois’ office, along with corporate and private individuals, and supported by the McLean Chamber of Commerce and the Arts Council of Fairfax County. 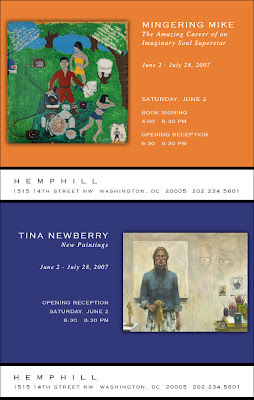 The Nevin Kelly Gallery, located at 1517 U Street, NW, Washington, DC, will host a solo exhibition of works by Chilean-born, Washington, DC artist Joan Belmar from May 23 until June 17, 2007. The exhibition, titled Color Transparencies presents Belmar’s recent work in paint, acetate and Mylar. The gallery will host an opening reception with the artist on Thursday, May 24, from 6 until 9 o’clock p.m. The public is invited. Joan Belmar is not a linear thinker. In fact, he thinks very much in circles. His work has always eschewed the notion that the straight line is a fundamental element of artistic composition. Recently, he has abandoned the strictures of the singular plane of the canvas as well. For “Color Transparencies,” the artist has constructed works from strips of painted Mylar that he fashions into circles and curvilinear forms and mounts on-edge to a backing of paper, wood or other material. These shapes form the main compositional elements of the work. He overlays the composition with translucent sheets of frosted acetate in which he has cut out shapes that reveal the strips of Mylar beneath. He draws on portions of the acetate so that elements of the composition exist above, within and below the frosted plane. The multicolored strips show clearly where the acetate has been cut away. Where it remains, the strips appear as if through a fog. The width of the strips, sandwiched between the backing and the layer of acetate, gives the works literal depth. Belmar is a frequent exhibitor in the Washington, DC area. He was born in 1970 outside Santiago, Chile. He received a degree in graphic design at the Catholic University of Chile before moving to Spain at the age of 24. There, he adopted the Catalan “Joan” for his first name (Juan or John). He came to Washington, D.C. in 1999 and in 2003 was granted permanent residency in the U.S. based on extraordinary artistic merit. His work is included in the permanent collection of DC’s John Wilson Building. 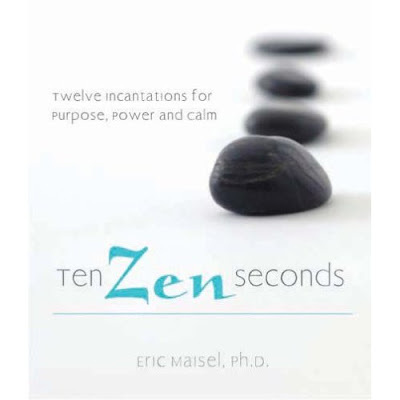 Author, ERIC MAISEL will be visiting an interesting group of bloggers this week to speak about his breathing and mindfulness techniques in his new book, Ten Zen Seconds . Here's the week's line up. Enjoy! Ken is a technical writer, singer/songwriter, Web developer, instructional designer, and non-fiction junkie who blogs about the nature of creativity. What is it? Why do we do it? How can we bring more of it into our lives? He is a co-developer of the Creativity Happens workshop and currently in training as a creativity coach. Ken and Eric will chat about how the Ten Zen Seconds approach can be applied to songwriting and musical performance. Also, we’ll take a look at the distinction between a theory and a practice - is it possible to grasp Ten Zen Seconds in any real way without putting it into practice? Sally Nicoll is the author of Bets and the City, a Bridget Jones meets Wall Street beginner's guide to day/swing trading known in the UK as financial spread betting. Sally and Eric will discuss how traders can profitably deploy Ten Zen Second techniques to improve decision making, cut losses and increase profits. Penny Plautz is a writer and a graduate of Eric Maisel's creativity coaching program. She is the owner of TranforMotion Studios & Creativity Center where she acts as a creative catalyst to the curious in her small farming community. Her latest book, Body Confidence From the Inside Out, was published last July by Whole Person Associates. In addition to her ezines, she has a regular column in her local newspaper that reveals the workings of a creatively quirky mind called "A Penny for Your Thoughts." Stress Less Living is all about bringing a fresh approach to the tired old subject of stress. Penny’s ezine subscribers will get a chance to ask questions about the Ten Zen Seconds approach to stress reduction. Kathryn is a Renaissance woman; she has worked as a librarian, psychotherapist, and community advocate. She is also a self-taught artist, poet, and an omnivorous, voracious reader. Kathryn dedicates her life to igniting curiosity, promoting creative and critical thinking, and inspiring enthusiasm in people for lifetime learning. She believes passionately in the innate creativity of all humans. In her blog, A Mindful Life, Kathryn shares her insights and discoveries with the world. Kathryn and Eric will chat about customizing the Ten Zen Seconds approach to high-intensity situations like childbirth, arguments, and athletic competitions. Melanie Bowden is a freelance writer, teacher, and mother of two. She teaches infant massage classes, writing classes, and speaks to parenting groups about postpartum issues. She is also the creator of the workshop, How To Reduce New Parent Stress. Melanie's mission is to help make the transition of others to parenthood a lot smoother than her own! She is the author of, Why Didn't Anyone Tell Me? True Stories of New Motherhood. Her blog, Spit-up on My Shoulder, provides news, information, and rants for the first-time mom. Melanie and Eric will chat about how Ten Zen Seconds can help new mothers stay centered and mindful. Detroit Free Press article here. by Mark Stryker. Every wonder what became of that theme of putting animal sculptures on the streets in the US of A? Well, now theres a new book out that chronicles 87 of those public arts projects. Collectively, the public art projects give a panorama of the nation, said "American Art Parades" co-publisher Karlynn Keyes -- from the "Belfast Bears" exhibit in Belfast, Maine, to the "Wild Salmon on Parade" in Anchorage, Alaska. ->>>> Examiner weekend (Sat.-Sun.) editions. WPA\C’s Experimental Media Series – ColorField.remix challenged artists to reinterpret the Color-Field artists with experimental video, sound and performance pieces. Selected works will be presented in a three-night curated and juried series. The Kraft Media Prize will be awarded to one finalist and one honorable mention finalist, selected by the jurors for Night 3. Jurors will make selections based on overall quality and innovation as it relates to Color Field influences. Irvine Contemporary is pleased to announce Robert Mellor’s second solo exhibition, New Scenarios, opening Saturday, May 26. Robert Mellor’s new series of paintings boldly expands his innovative fusion of hard-edge organic composition techniques and original color harmonies. Robert Mellor, Lithe, 2007. Acrylic on canvas on panel. 48 x 40 in. The word “scenario” originally referred to the instructions on the back of painted theater scenery used as directions for actors entering a “scene.” Robert Mellor’s New Scenarios can be viewed as new propositions for visual enactment by the viewer, each work providing cues for engaging with the composition, layer by layer, edge by edge, line by line, color by color. While it can be said that any work of art comes alive as art by a viewer’s active engagement, Mellor foregrounds this relationship by composing works of arresting beauty that compel viewers to re-enact the process of composition with the artist. In this new series of paintings, Mellor often combines references abstracted from landscape and organic forms, city scapes and architecture, Japanese woodblock prints, and cascading fabric from fashion design in totally new ways. His astonishing and original color harmonies command attention and continually reward viewers who take a contemplative pause and convert compositional space into time. Mellor is also the edge-master, sculpting visual space with his hard-edge lines and interplay of forms, working at the edge of figuration and abstraction, building paintings from multiple layers that push the works into three dimensions as substantial objects in their own right. Mellor’s New Scenarios are a set of enticements and seductions for viewers that make a bold, affirmative statement for new directions in painting today. Robert Mellor has an MFA from Claremont University in California. He began his gallery exhibition career in Los Angeles, and now lives in works in Chatham, VA, near Washington, DC. Who are the Mid City Artists? They are a diverse and talented group of nearly 40 professional artists who have come together for the purpose of promoting their art, and the Dupont/Logan neighborhoods they call home. It is an opportunity to integrate their art with the fast growing retail and commercial concerns that are located in this area. They are here to let you know that “there is more than a real-estate boom in Mid City - there is a group of extraordinarily talented artists who have quietly made a name for themselves by offering great art at affordable prices to the insiders who know them. The local Community has discovered this treasure, and you can discover it, too. Susan is an artist and writer who exhibits mixed-media sculptural pieces, myth-based story pieces, copper repousse' and masks. She designs masks for local theater as well as presenting workshops in mask-making. Her blog features stories from her sculptural pieces, new poems and short stories as well as personal essays on the art of life and life in the arts. The special focus of our day will be mindfulness techniques for the working artist with an emphasis on how creating islands of mindfulness outside of the studio can support and promote work inside the studio. When you can't get into the studio, how you can maintain a positive attitude to facilitate your creativity? Scott is a poodle-owning, music-loving and cigar-smoking freelance writer and mental health activist based in Toronto. His blog, Finding Your Marbles, is an informative, friendly, and inspired “Handbook for life” for people suffering from mental illness. Scott's mission is to share skills that enable people to manage their day-to-day lives so that they can overcome mental illness and reach their true potential. Scott is particularly interested in how mindfulness techniques can assist sufferers with managing their illnesses and getting on the road to recovery, with a special emphasis on short, easy-to-learn techniques that they can use to help them get through the tough moments during the day. Bernadette is a writer, author, artist, Feng Shui practitioner and professional organizer. Her passion is to assist others in identifying ways to create sanctuary within and without. Ray is a professional actor and artist, and integrates his love for these crafts with life experience to help others identify and express their own uniquely creative self. Their website/blog encourages self-discovery and healing through introspection, awareness, inspiration, and the creative process. Bernadette, Ray and Eric will chat about mindfulness techniques for folks going through a major life transition such as separation, divorce, loss, disability, and aging. Mary Ann is a part time writer and a full time manager at Borders Bookstore in Union Square. She is currently planning to go to Italy in 2 weeks with some women friends and is feeling guilty that she hasn't learned the entire Italian language or done more research. Mary Ann has been married forever and is a strong feminist and liberal Democrat. Trista Hill is a self-employed fine artist and musician who posts her more personal issues involving creativity on her blog so as to keep her website more professional. : ) She is a professional harpist who plays for special events in the central Ohio area, and is currently working on making a CD of her own harp compositions a reality. She creates artwork on commission, but has great aspirations to finally start a series of paintings that captures the creative and spiritual aspects of being a woman at this age, at this time, on this planet. Trista would like to focus our day on what it feels like to work in a vacuum -- being self-employed, not having a lot of support due to relationship issues, and structuring your creative time so that you feel that you are actually making progress because you remembered why you were doing this work in the first place. Rahul and Eric will chat about how technical communicators and writers can apply Ten Zen Second techniques. Please join Civilian Art Projects for an informal discussion with internationally recognized artist, Hasan Elahi as he discusses his exhibition at Civilian, the Tracking Transience project, and his forthcoming participation in the 52nd Venice Biennale. Free with light refreshments provided. Seating is limited. RSVP to info@civilianartprojects.com. Hoops for Africa and launch of ON LOKATION! -- there's an opening of photos of Jonathan Manion at Govinda this coming Friday, May 18 -- and there is going to be a hip hop DJ playing at the show. The premier of the movie The Hip Hop Project opened this past Friday. It is an incredible and inspiring documentary. Go see the movie in the next 2 weeks - because apparently if a movie doesn't make it then, they take it out of the theaters- and it would be good if this movie stuck around awhile. In the DC area, it's showing at Dupont Circle 5 Theaters, & in theaters in Silver Spring and Marlborough. Tuesday, May 15, 2007 at 6:30 p.m.
featuring The "New Washingtonians Jazz Orchestra" at Duke Ellington School of the Arts under the direction of Davey S. Yarborough. in the Samba School in Brazil in June, 2007. Inter-American Development Bank - 1330 New York Avenue NW Washington, DC at Metro Center, 13th Street exit - Free and open to the public - Photo ID required First come, first seated - Everyone is welcome. Artomatic closing weekend, May 18-20, to offer more than 50 free events: After five entertaining, engaging and eye-popping weeks of art, performances and special events, Artomatic will go out with a bang during its closing weekend, May 18-20. Visitors will also want to be sure and check out one new addition to Artomatic — a display of historical patent documents on the sixth floor. Exhibited by patent researcher Randy Rabin, who rescued them from a shredder, the documents show patent drawings for inventions such as a Wright brothers flying machine, a rocket by space pioneer Robert Goddard and an electric light by Thomas Edison. The new exhibit is fitting because Artomatic is being held on two floors of a building formerly occupied by U.S. patent and trademark workers. Held regularly since 1999, Artomatic features 90,000 square feet of paintings, sculptures, photography and other creative work. The event, which runs through May 20, is being held on the 6th and 8th floor of an office building at 2121 Crystal Drive, in Crystal City, Arlington, VA. The location is within walking distance to the Crystal City Metro station. Free garage parking is available evenings and weekends across the street from Artomatic (next to the Chevy Chase awnings), but visitors are strongly encouraged to take Metro. Sunday, Tuesday, Wednesday: Noon–10 p.m.
What a kool way to spend the afternoon on Saturday adding to the collective field of color stripes on 8th St. NW in Penn Quarter. I was lucky enough to arrive while the music was still playing and helped to paint an orange stripe the length of the street. Carolyn Parker was passing out t-shirts to all the volunteers painting in the street. Lots of other folk, including Rachel Dickerson and Tony Gittens from the DC Commission on the Arts and Humanities and folks from the Corcoran Gallery of Art were wielding paint rollers and pouring the buckets of paint. Here's some pics to enjoy of the days work. Mokha Laget, long time studio assistant to Gene Davis, designed the project. She did a great design which will stay on the street for the next couple of weeks. Link to my Flickr photos Enjoy! Metro to Gallery Place and walk to 8th Street towards the mall. 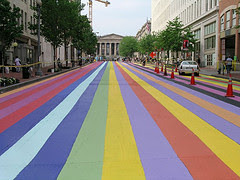 The stripes are on 8th St. NW between D & E.
Artomatic runs until May 20th and over 5,000 visitors came by last weekend. Over 50 more activities this weekend . . . Plan your trips to Artomatic! Plan many trips to Artomatic! Gregorio Luke will explain and illustrate Mexico's victory against French occupation forces in the Battle of Puebla, May 5th, 1862. Since 1999 Mr. Luke is the Director of the Latin American Art Museum at Long Beach, CA. He is one of the most renowned Mexican art lecturers with more than 20 years experience presenting and promoting Mexican art and culture. Moving Pictures: American Art and Early Film, is on view at The Phillips Collection through Sunday, May 20th. Who's that Artist In Your Metro Station?